À nous de déterminer pourquoi on a débuté notre relation avec un cheval. Pour ma part, je fais la promesse solennelle de ne JAMAIS embarquer sur un cheval si je ne peux le monter au licou; j’avancerai ma communication au sol et le jour viendra où il me donnera la permission de le monter au naturel ! Je suis une "accro" des magazines, revues, et informations diverses provenant des instructeurs se spécialisant dans le développement naturel. J'ai donc pensé qu'il serait intéressant de partager certains articles concernant les points de vue de ces spécialistes. 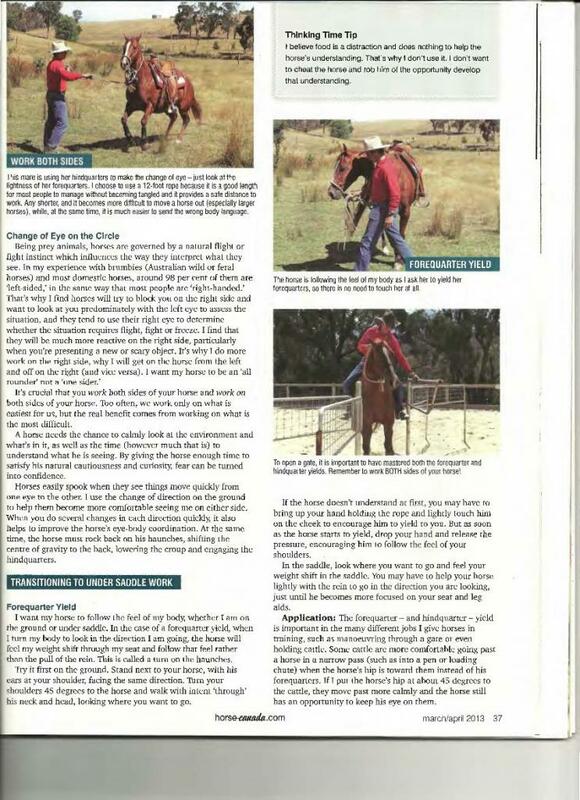 Je vous propose un premier article de Stacy Westfall paru dans la revue America's Horse (AQHA magazine) de mars-avril 2011. Je posterai un nouvel article tous les mois, donc bonne lecture ! ofher car, filled it with gas, and we were on our way. The drive was about an hour and a half, and then I was to drive her car home. thought. The brake pedal went nearly to the floor with a grinding and a pulsing feeling. really needed to get hers looked at. She was unaware that there was a problem. Later, after she returned, I followed her to the garage where the mechanic was shocked that the brake system was still working. He said he was amazed that the brakes had not locked up or failed completely. What was different when I drove the car versus my friend driving it? Was I a mechanic when I stepped behind the wheel? No, far from it. But I did have one thing she didn't, which was experience driving many different cars. That experience gave me a "feel" for what different braking systems felt like ... and hers wasn't right. 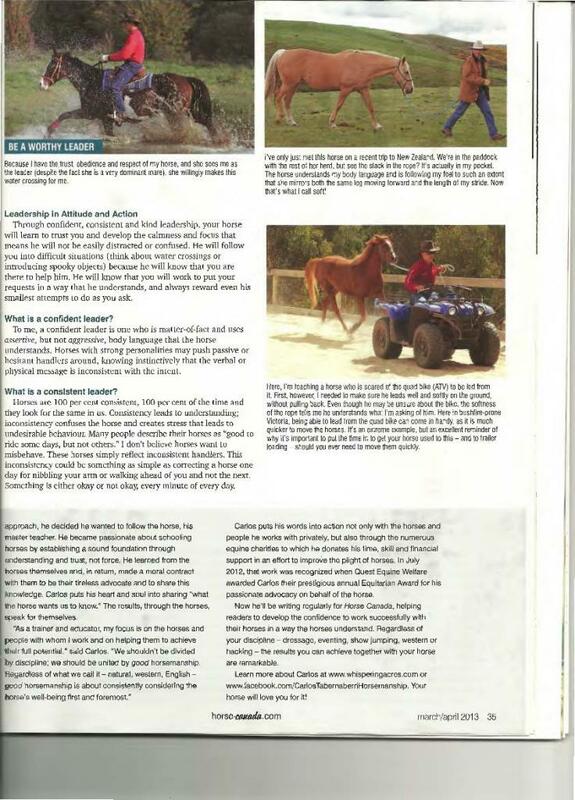 Experience with horses can be very similar to the experience with the car. About six years ago, a woman approached me to take some riding lessons. She was. having trouble with her flying lead changes. When she came for her first lesson, I was impressed with the amount of work she had done with her horse. Overall, she had most of the parts and pieces necessary for the flying lead change. She and the horse were almost there. As I coached her and helped her with the horse, I asked if I could ride the mare for just a minute. She agreed, and I climbed on. It was like having flashbacks to the car-driving experience. Things were working with the horse, but something wasn't quite right. The horse would move diagonally left and right, but the two sides didn't match. It felt like riding two separately trained creatures. While trying to explain what I felt, I struggled for an explanation. I let her ride one of our horses to get the "feel" of what I was talking about. Not surprisingly, she thought my horse felt strange. She had been riding her mare exclusively for the last 15 years and was so comfortable with her mare that she thought my horse felt wrong. During the next few months, we worked on her horse but also made sure that she rode several other horses at my barn. 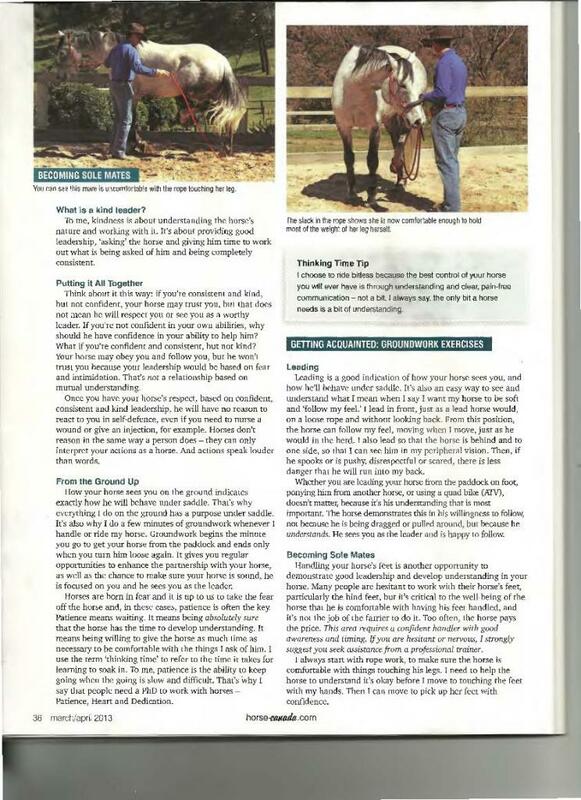 After test-riding many of our horses during lessons, she began to be able to feel that they all had a similar feeling ... and that her mare was the one who was different. Different isn't always a bad thing. The chal~enge is to make sure that you are still on the right track. Sometimes when you limit your experiences, you accidentally limit your knowledge. Consider broadening your experiences. Remember that get the feel of it. Both of the women in these two stories had one thing in I, common; they had been driving that one car or riding that one horse, exclusively. They did not have a wide array of experiences to draw from. My challenge to you is to have both. 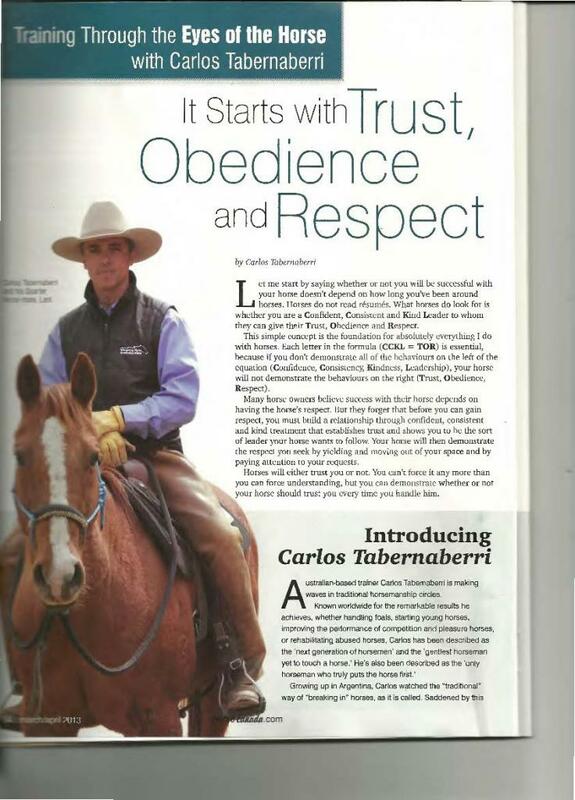 Having one horse you know very well is both rewarding and insightful. But don't stop there. Volunteer to help a friend who has too many horses. Try riding hers or doing some ground work. It can be a learning experience and a way to spend time and help out a friend. It's a win-win situation. Take some lessons -especially if you can ride the school horses sometimes. Yes, they will feel strange, but think about how that will add to your knowledge bank. Attend a horse event and watch or participate, go to a horse expo, buy a DVD. Study what your favorite instructor says and then study what at least three other experts have to say on the subject. 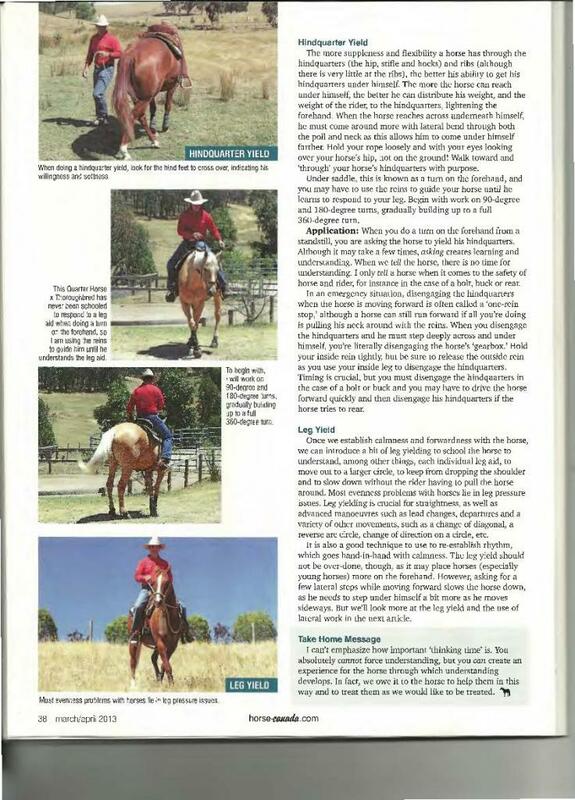 Visit www.westfallhorsemanship.com or call (419) 946-4848 to learn more about AQHA Professional Horsewoman Stacy Westfall of Mount Gileac£ Ohio.